Shopping tourism is relatively a new concept in India. Kerala Tourism attempted to replicate Dubai Shopping Festival but with limited success. Many feeble attempts, Surajkund Mela in the NCR region for example, are being made across the country for a heady mix of shopping and tourism. But the real push has come from a totally unexpected quarters—Swedish home furnishing major IKEA . Come to think of it. Ever since IKEA opened its shop of gigantic size in Hyderabad—friends, families and spouses are jet-setting from Delhi, Mumbai, Bangalore and Chennai to shop in IKEA Hyderabad which is an experience hitherto unknown to Indians. Bangalore techie Arun Chaitanya and his wife Pallavi, a physician in Mumbai, flew to Hyderabad to look at furniture and kitchen stuff for their new 3 BHK home in Whitefield. “I worked in the US and UK and other geographies. I could organise a simple living and kitchen in just one day from things I brought from IKEA. These products are sleek, stylish, easy to handle and value for money,’’ said Chaitanya. “I don’t miss a visit to Lush for my facewear and IKEA for my homeware when I travel overseas. One could only buy small things from IKEA due to weight restrictions in airplanes. That’s why I and my husband drove to IKEA store in Hyderabad a few weeks ago,’’ said Shalini Naidu, an interior designer in Bangalore. IKEA is a store that most Indian techies and their families would visit to pick up furniture, cookware, crockery, cutleries, glassware etc to quick-fix a home in the U.S., Europe or wherever they worked. The company sells everything, including beds, sofas and chairs, in flat packages, making it so convenient to carry. IKEA stores are favourite destination for many Indian leisure and business and travellers too. The brand has 423 stores in over 50 countries. IKEA has been a long wait for Indians. It took almost a decade or so for the company to get its first store set in the country. It opened its maiden store in Hyderabad in August, the construction of its Mumbai store is in full-swing and it just broke ground for its Bangalore play. Not just those, more stores and multi-channel formats are in the pipeline. It plans to open 25 stores across nine cities by 2025. It also has a mandate to open 49 stores across the country by 2030. The price point is a huge attraction at IKEA. Its lowest price tag in India is as little as Rs 15 for a set of four, made-in-India plastic spoons. The store already sold more number of spoon packs than the number of people who visited the store ! A short iron stool designed for India is priced at Rs 299. Tool-kits are moving at quick pace as these are critical when you buy self-assemble furniture and kitchenware. Hyderabad outlet has the largest IKEA Restaurant in the world with a seating capacity of 1000. (Bangalore will also have a similar sized IKEA Restaurant). It serves Swedish and Indian cuisine: Smoked Salmon, Chicken Meat balls, Rice Biriyani, Soups, Green Salad, Cut Fresh Fruit, Coffee, Tea and other beverages. All these are reasonably priced to keep the Indian wallet and pallet happy. The store already seen over a million footfalls since its opening on 9th August. The responses were overwhelming and the store received over 40,000 visitors on the first day itself. The 400,000 sqft IKEA store that stands with its iconic blue-and-yellow signage in Hyderabad, Telangana sells 7,500 products. IKEA’s Hyderabad store offers 7,500 products of which 95 per cent of them are global offerings while 5per cent are India-centric. IKEA globally has over 1,1000 suppliers—60 per cent from Europe, some 30 per cent from China and 6 to 8 per cent from Americas—and 55 of them are in India. The showroom displays how large furniture items—available in ready-to-assemble flat packages—look when assembled. They include cots, sofa sets, tables, chairs, drawers, and storage. Other things include plastic cutlery, kids’ toys, and potted plants and dozen of kitchen items and bed linen, pillows and cushions etc. The store plays bright colours, for India, across all sections, especially in the the textiles section, bright shades, red, orange and blue are displayed, instead of browns and greys in the European markets. A Large portion of visitors are still on an exploratory mode. They spent a lot of time in the store, but restaurant is sort of crowded even during weekdays. Though customers are yet to splurge on the big-ticket items, company says people are buying more number of low-ticket items. On an average, a customer is buying 13 products which are higher than most other markets. To cater to a price sensitive audience in India, IKEA has kept some 1000 products under Rs 200. “We strive to cut unnecessary costs in our supply chain to achieve our goals of offering affordable home furnishing products,’’ said Patrik Antoni. IKEA is well aware that Indian customers are famous for their price sensitivity. “Before coming to India, we did a lot of research about the market and consumer behaviour,’’ added Smedberg. IKEA’s 500,000 sq. 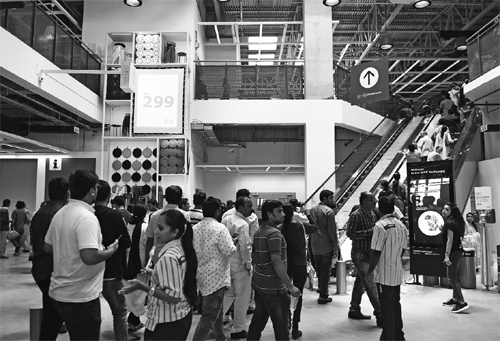 Ft Bangalore store is expected to attract more than 7 million visitors per year. It was in 2012 that IKEA first planned its India foray, those were still early days for single retail brands in the country. The Scandinavian furnishing major took many years to get clearances from the Foreign Investment Promotion Board (FIPB) and Cabinet Committee on Economic Affairs (CCEA). IKEA is currently doing a lot of branding in India. You will see it on airport conveyor belt, rickshaws, placement of a huge chair at Char Minar and branding on bus shelters, etc. The company imports most of the products it sells, and many are covered by the latest customs duty hike. The list includes tableware, kitchenware and household items made of plastic and travel bags, among others. India is already a $10 billion plus market for home furnishing, although most of it is currently in the unorganised sector. IKEA will also face tough competition from e-retailers including Amazon, Flipkart-Walmart, PepperFry, UrbanLadder and others. The Swedish company’s entry marked one of the most significant overseas investments in India. But will IKEA, the world’s largest furniture retailer with 38 billion Euros in annual sales, be able to garner market share and mindshare in tune with its mandate is yet to watch and wait. The company had earlier it would explore a multichannel strategy in the country that comprises of large format stores, digital sales and experiential stores. It is also planning to open multiple small format stores of 1,000-5,000 square meters. IKEA is also in dialogue with several leading realty players, architects and interior designer firms to strengthen its B2B business. “The retail business is changing across the world. The markets like Europe are our mature market and our legacy is doing physical stores. For us India we are really new and that gives us the advantage to try new things. In the country, we can move much quicker towards the modern way of retail. So we want to start both offline and online together,’’ said Antoni. IKEA strongly believes that India’s core culture is quite similar to that of the company. The company has conducted a 360 degree study—it interviewed a large number of HR heads, business leaders, retail executives and staff across the country—to understand what’s on the mind of young employees in the retail industry in India. Commenting on the culture match between IKEA and India, Månsson elaborated: India is a very friendly market for us as the core of India is very similar to the core of IKEA in many ways. Young people want to join a company that gives meaning to their lives, a company they can relate to and a company that offers them a holistic growth.